Whether your logs will be used for making furniture or fueling a fire, the wood within will only benefit from having the bark removed. When you don't debark, the wood will not dry evenly, and beetles will likely still remain under the bark. 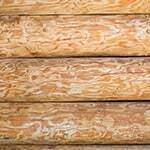 Beetle larvae will hatch and tunnel through the wood, creating weak spots and encouraging mold growth. If you're looking to have clean, long-lasting wood to use for furniture or structure building, debarking is necessary to maintain structural integrity and appearance. 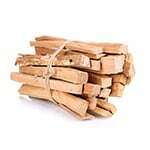 If you're planning to use the wood for your fireplace, debarked wood will season better and burn cleaner. During the felling and transporting process, tree bark accumulates a lot of sand, grit, and even some rocks or pebbles at times. If you're planning to use a saw mill to create lumber, you know how important it is to get the most out of each blade. The grit, sand, and pebbles that settle into the bark will quickly tear up your saw blade, not to mention the bark itself. The less waste, the better when it comes to placing your timber on the sawmill. So if you can strip away the bark, along with the accompanying sand and grit, your saw will only be cutting the usable wood itself. There's a lot of back and forth in forums about whether or not firewood should be debarked. While some say you might as well burn the bark along with the fire, others say to debark for a better burn. Bark can be used as fuel, and will make great kindling in a campfire, however it's not the best burn quality for fireplaces and wood burning stoves. And debarking prior to storage will help the firewood to dry and season more evenly. Because beetles and other bugs make themselves at home under bark, they will tunnel through the wood and create pockets for moisture to become trapped, leading to mold and moisture problems. Debarking will rid your firewood of these beetles, and will allow moisture to more easily escape the wood. Drier, better seasoned wood will burn cleaner and more evenly as well. So when you bring your firewood in from the log rack, you'll have cleaner burning wood with less smoke, and you won't drag bark debris in all over your floor. The only reason not to debark is convenience, but when you use a pressure washer, it's quite easy. 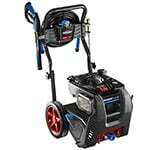 To debark with a pressure washer, you'll want to make sure you invest in at least a 2,000 PSI pressure washer. Anything less will cause difficulty removing some types of bark. 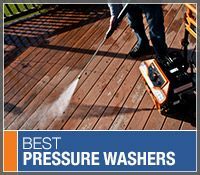 Many people who use a pressure washer for debarking recommend using a 3,000+ PSI pressure washer, but you don't necessarily have to opt for that much power. Using a turbo nozzle is effective for removing bark faster without doing as much damage to the wood, however you'll still want to spray at a bit of an angle and keep the pressure washer wand moving at all times. Directly holding the nozzle to the log in one position will cut into the wood once it breaks through the bark. Move the wand in a sweeping motion against the grain for the best results, and continue to roll the log so you can get all sides. Once you've finished debarking, prop the log up so air can access it on all sides while it dries. That's it, nothing too complicated. It's much easier to debark with a pressure washer than it is to use a hand tool, such as a spud or a draw, meant for scraping and chiseling the bark away. Debarking Logs.. Our Power Equipment Direct how-to library can help you learn about Proposition 65 Product Labeling, Sales Tax Information and Product Recalls for Pressure Washer Equipment.